An earthquake with a magnitude of 5.3 struck off the coast of western Turkey on Saturday, according to the country's Disaster and Emergency Management Authority (AFAD). The quake struck Izmir's Karaburun district at 10:50 p.m. local time (0850GMT), the authority said. The quake followed a previous earthquake of 4.2 magnitude which struck at 10:33 p.m. (1933GMT). 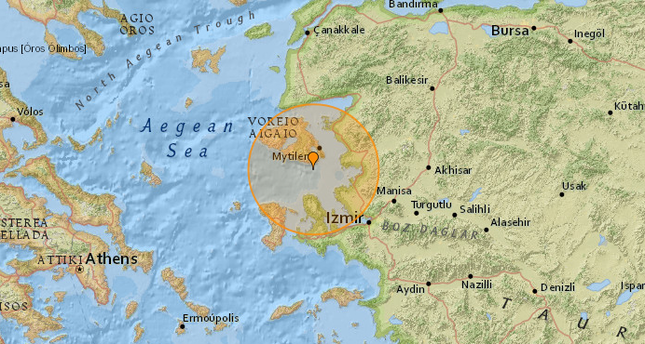 Effects of the quake have been felt on Turkey's west coast, especially in Izmir and nearby provinces. No casualties or damage have been reported so far. The pair of earthquakes come not even a week after a 6.2-magnitude undersea quake shook the Greek island of Lesbos and Turkey's west, killing one woman and injuring at least 15 others. The tremor displaced more than 800 people.